1. Read MANY reformed authors. Piper gets a lot of things right in terms of understanding God’s Sovereignty, but misses in other areas (i.e. baptism, quasi-pacifism). Sproul gets baptism right, but goes with classical apologetics instead of presuppositional/covenantal apologetics. God has purposely allowed many of us to have blind spots in order to avoid us being arrogant about ‘having it all right’ (for those asking, eschatology is my ‘blind spot’ and I’m more than willing to slow my roll here….). 2. People learn and come to understand at different rates. Phil Johnson​ took about 15 years, I took 4, Michael Armstrong took around 2. If you are new (4 years or less) to reformed theology, avoid arguing about Calvinism over the internet, please. It’s very easy (I speak from experience) to slip into fighting to be right and thinking it’s because you’re fighting for biblical truth. Yes, you can be right (and being biblically correct is important), but the motivation behind being right may cause your good works to turn to wood. 3. Grow thick skin. There are plenty of people who will simply attack you because they have no other Biblical evidence on their side….so they make the discussion about YOU instead of about what the Bible teaches on the subject. Forgive them ahead of time, keep your tone calm and the subject of your discussion on the scriptures. 4. Remember you were once one of those “I don’t care about denominations/I don’t follow man-made systems/I don’t follow Calvin or anyone, I follow Jesus” folks once too. Full of zeal, lacking in knowledge. Be patient in conversation (see #3) and ready to explain yourself at length….repeatedly. 5. If you understand that the noetic effects of sin (sin not only affects humanity spiritually but also intellectually) can cause us to take ‘longer’ to get things at times (sometimes not at all), understanding why some of your non-Calvinistic friends can’t see what’s “RIGHT THERE!!! !” in scripture makes a whole lot of sense. Be patient with them, pray that the Lord will gradually take more of the ‘blind spots’ out of their vision as He did with you. It is the Lord who opens eyes to see truth. He may use you…. He doesn’t have to. It does NOT all depend on you. 6. Hold truth humbly, with mercy. Don’t be quick to shake your finger at folks – you too could have been giving money to Creflo Dollar, thinking it was the Lord’s will to sow a seed. God pulled you away from that mess (see #5). 7. If you are new to the reformed tradition (i.e. you just realized that the Bible DOES teach ‘Calvinism’), get into a consistently reformed church ASAP (PCA, OPC, reformed baptist….in that order would be my preferences). Do NOT try to ‘change’ your church from the bottom up (i.e. a Sunday school class, discussions with other congregants designed to prod the pastor into bringing these issues to the fore and discussing them publicly). You will get branded as a trouble-maker, divisive, unloving and people will turn on you. Leave your old, “semi-Arminian, semi-pelagian, nice-people-who-love-Jesus” church through the front door (in full view and in good standing). Why leave ? Simple. The type of growth you experience is directly tied to the type of preaching you sit under. Reformed theology has consequences for Christian living in every area of life. It is meant to not simply be “a few things I choose to believe” or even “a few things I believe because the Bible teaches them” or even “stuff related to salvation”, but an entire worldview. It is MUCH larger than simply “the five points”. You will not get that full worldview-level preaching sitting in the church you are currently in anymore than a child playing on the beach will get an idea of how deep the ocean is by staying on the beach and simply looking at it from a distance. 8. Read more Bible than reformed authors (but read reformed authors). Reformed authors are good for getting ahold of how exegesis and application should work. J.I. Packer is no substitute for Paul. J.I. Packer may help you understand Paul a bit better, as Packer (who is about to turn 90) has been walking with the Lord and dealing with hard passages of scripture longer than you (and probably your parents) have been alive. But nothing will beat the Holy Spirit working to renew your mind as He opens the text of scripture up to you while you read it. 9. Learn from older brothers and sisters in the faith. Learn from older writings (read Calvin, not just Piper and Sproul – see the second half of #8), learn from older brothers and sisters in the church (see #7). The Mark Driscolls of the world come and go. Driscoll’s arrogance at correction from men like MacArthur came back to bite later when it was shown that every single criticism men like MacArthur had against him was true. Beware the arrogance of ‘youth’. Better yet, beware the arrogance of ‘we need to hear something relating to now, not what people did yesterday’ (as if humanity has changed fundamentally). If you aren’t teachable, you’ll become hardened, argumentative and arrogant very quickly. – Christ saved me, not just made me ‘savable’. – It was God who orchestrated events in my life to bring me to a point of realizing my need for salvation. – No, I suppose that if I was left to myself without God keeping me, I’d probably walk right into hell. – Yes, at some level, I understand that God is indeed guiding all aspects of my life, though I don’t exactly understand how and ultimately I know that my life is truly and completely in His hands. This is a follow up to the article The Difference Between Discipleship and Debate. Proverbs 27:17 – As iron sharpens iron, so a man sharpens the countenance of his friend. An examination of this verse shows us that the foundations of a friendship, when based on mutual unconditional love, give us the ability to aid one another in the pursuit of holiness. It is speaking about working with each other and teaching each other so that we are becoming more and more like Christ, by the power of the Spirit through the application of the Word of God to our daily lives. It is, in short, a snapshot of what it means to be making disciples. Discipleship is often misunderstand and even more often neglected in the Evangelical church today. So much that the church does is so far from the Biblical blueprint for ministry that the church seems to be losing its way. People pick a church as a consumer picks a restaurant. Do they serve my favorite foods? Is the service good? Do I leave feeling satisfied? Is the price paid a fair value for goods received? The corporate meeting of the local church has become more and more about what the congregation wants and less and less about what God commands! Instead of coming to focus on God and give Him the glory and honor and praise due His name, people come to church to feel better about themselves and how God supposedly views them. They come to get, not give. They come with felt needs, seeking a solution to their problems, wanting encouragement that it will all turn out okay. In fact, people are very good at going to church but very bad at being the church. Why is this? It is the evidence of a failure within the leadership of the church to uphold the Word of God. The simple, straightforward, foolish to the natural man Word of God. And the greatest area of neglect appears to be the area of disciple making. How can we make disciples when we are wanting to come and get instead of give? The process and the relationship of making disciples is very much a two way street. It is not just coming to get from the professional Christians whose job it is to teach us the Word of God and encourage us in living what we hear. Discipleship occurs inside and outside the meeting of the church. It occurs when two Christians work hard at building one another up. It is indeed Body Building. The work of service to each other in the Body of Christ for the purpose of edifying the whole church. The leadership, our elders and pastors, are given by Christ to the church for the specific task of equipping us to build each other up. It is how Christ builds His church. Pastor-teachers work at “equipping the saints for the work of the ministry for the edifying of the Body of Christ” (Eph 4:11-12). That means that we are to be taught how to make disciples. So if we are failing to make disciples we must start where we see the root of the problem. And that root is the failure of those in leadership within the church to do things God’s way! If it is true that many Christians are not being discipled or making disciples, then the church is not growing. No matter how many people are attending services, no matter how many members are on the roll, no matter how much money is given, no matter how large the building, and no matter how dedicated the congregation – if we are not making disciples we are failing to obey one of the primary and essential commands given by Christ to His Church. Perhaps the truth is that we have not been taught how to disiple others. Perhaps we have had a wrong view of discipleship all along. Or maybe we are not being held accountable to actually go and make disciples. Whatever the case and wherever the problem, we need to see discipleship for what it is and that will help us to determine whether or not we are being equipped for service to one another in the body. Disciple making is not about a teacher/student relationship. There is a false belief prevelant in much of the church today that it is the job only of those who are mature or who are assigned the role of teacher in the church to disciple those who are younger and perhaps weaker in the faith. While there is responsibility for the older (more mature) to teach the younger (babes in Christ), it is also at the same time true that within the body we are commanded, not expected, but commanded to esteem all others as better than ourself (Phil. 2:3). So when we work at making disciples, once people have been brought to saving faith in Christ by the work of the Spirit and the Word, we are now to teach them and be taught by them about the Lord we love and serve. Discipleship is “teaching them to observe all things that I have commanded you” (Matt 28:20). But it is also being taught! There is nothing worse in the church than an un-teachable teacher. Like it was stated already, discipleship is often misunderstood because we believe that it is a one way street. Either we believe that the leadership in the church is responsible to disciple us and therefore we bear none of the responsibility for disciple making. Or we believe that once we have arrived at a mature understanding of the Word of God then we are to teach others, looking down on them in their ignorance and need for instruction. A shepherd does not look down on his sheep because they are hungry and need to be fed. He does not consider them dumb animals and despise them because he must be sure that they are provided for and fed nourishing meals. If he does, he should not be a shepherd. Jesus as our example, as the Good Shepherd, shows us the love and tenderness that a Shepherd has for His sheep (John 10:11-15). So we need to approach discipleship from the point that we have something to give and to get from one another in the body. Our testimonies will be different, our growth at a different pace, our maturity at a different level. But we are all to be learning from one another. And there is the root of much that is leading to a lack of disciple making in the church, a wrong view of others members in the body. What then can be done to make sure that we are being equipped to serve one another within the body of Christ? It is not my intention to delve into a study of the role and duties of elders, nor to give specific details about the ministry of the Word from those who teach us. But it is my intention to show that we must be testing a ministry and a minister by the Word of God. As we know, to disciple someone and be discpled by them we must be interacting in a relationship built on trust and unconditional love. And here is the key for evaluating a ministry or a minister in their effectiveness at making disciples. Are we being taught and led by example, or does the leadership have a “Do as I say, not as I do” mentality? What are we being taught about disciple making? Are we being effectively equipped to humbly and lovingly serve one another as members of the same body? A glaring fact that cannot be ignored is that those who teach us and model for us Christian behavior must be held to the standard of the Word of God. They must love those in their care unconditionally. They must be humble. They must be holy. They must be men of God! And what is the purpose of this crown of glory? It is the mark of a faithful minister that will be thrown at the feet of Jesus in worship and adoration of the One who gave Himself for us and Who we were blessed to be serving as we cared for His body. But today, the truth is that many who claim to be teachers, many who hold with a tight grip to the offices of the church, many who are responsible to be an example to the flock are setting a bad example! “How?”, you ask. The failure to understand and apply disciple making principles within the church stems from misdirected love within those who should be leading us by example. Those pastors and elders who know what unconditional love is but lavish it upon themselves instead of on Christ and those they shepherd! Instead of fulfilling the mandate of 1 Peter 5:1-4, and serving willingly, they serve from compulsion. It is irresistable to them to be in a postion of power, authority, prestige, and leadership. They are drawn to the praise of men, the adoration of those who look up to them for their abilities to preach or teach or explain hard truths. They are in it for dishonest gain. Instead of seeking to build up Christ’s church they are seeking to build up their ministry. As a result they lord it over those in their care. Those who would trust them and follow their example are neglected and abused and trampled under this stampede towards self-magnification. Instead of a self-sacrificing love for Christ and His people, these shepherds love themselves and their comfort and their ego. They know what unconditional love is, and it is how they think about themselves, pampering their flesh, praising their accomplishments, parading their abilities and talents, and failing to realise that it is all a gift from God. It is mis-directed love. Peter is clear in his second epistle that we can tell a false teacher by the way he lives. 2 Peter 2 speaks about the depravity of false teachers. They have eyes are full of adultery and cannot cease from sin. They are never full of self or sin. They may appear holy on the outside, but what is in their hearts will eventually come out of their mouths (Matt 15:18-19), and what they truly believe will eventually be made manifest in their behavior. The chief example I want to deal with in this article though is a matter of manners. These false teachers, these who neglect the Word and cannot teach others to make disciples, are often identified by their manners or the lack thereof. The shocking truth about the making of disciples is that too many teachers have abandoned the pathway of being a loving, consistent, self sacrificing example and have instead settled into the very bad habit of trying to shock people with their teaching. We are seeing a rise in those in and out of reformed circles, usually noticed as those embroiled in the latest controversies and fads, who are just plain rude in their behavior. There are actually debates on Christian internet forums as to whether a Christian can use profanity in every day life, or how far we can go into sounding like the world while remaining distinct from it. Leaders in the Federal Vision movement and the Emergent/Emerging Church movement (just to name 2 current examples) thrive on controversy and on being crude. It is a deliberate effort by “ministers of the gospel” who think that to engage the culture is to shock the culture and that to motivate the church to obedience is to harass her into action. They are not shepherds lovingly and sacrificially leading their flocks. They are brash cowboys who are driving mindless herds of people according to their own agenda. And a benchmark, a signal of the validity of their message and their ministry is seen in whether or not they are courteous and well mannered. To be sure, a man’s message can sound right, but if his life and his attitudes are wrong he is still a false teacher and will mislead the church. That is why the qualifications for an elder in the church and a deacon in the church are based on his character, his relationships, and his personal holiness (1 Tim 3:1-13; Titus 1:5-16)! Notice, there is not a doctrinal summary or confession of faith listed in Scripture that a teacher must adhere to in order to be a teacher. But there is a list of character qualities that he must meet. Why is that? Because what you believe is manifest in how you behave, and sound doctrine always leads to sound living. Here we see why a man can sound right but be wrong. If he is truly holding to sound doctrine, then what he teaches will lead to right living in his own life and in the lives of those who hear him. Sound doctrine is doctrine that leads to godliness. This latest fad of shock jock preachers is nothing more than an abdication of the purest motive for ministry, unconditional love for Christ and His body. Because discipleship is based on love we need to know what love looks like. Sure, 1 Corinthians 13 is a common and well know passage, the definitive passage on love. But perhaps we have forgotten how love is defined. Let’s look there and see how a minister of the gospel is to behave as an evidence of his love for Christ and the church. A ministry and a minister motivated by love will suffer long. There is patience and a willingness to set self aside and even allow self to be abused for the sake of those we lead and teach. There will be kindness, acting and speaking with gentleness. There will not be envy of the work, ministry, or success of others, trusting that as the Word is consistently sown God will give the increase. There will not be a a parade of self for others to see, seeking opportunities to increase ministry or influence by building a reputation. There will not be a puffing up. A man who is puffed up is a man who has knowledge without love (1 Cor. 13:1-3). There will never be rude behavior! There is no crudeness, no hard exterior that is rough and gruff, there is no desire to shock or appall people with the latest new theology. There are manners and common courtesy. There is not a motive do it for what one can get. It isn’t for show or for self. There is not a easy provocation into arguments where one is known to live to fight and argue, as if the fun were in the battle and wounding sheep was sport. There is not a thought toward evil. The term evil means “that which harms.” There is never an intention or motive toward harming someone else. There is not rejoicing in iniquity – iniquity is using Christian liberty as an occasion for the flesh, it is a sin of the self will, so that even good things can be iniquity if they are done for the wrong reason. There is however rejoicing in the truth. There is a desire for the truth to be taught clearly and embraced willingly. And when one is motivated by love for Christ and His church, there is a willingness to bear all things, believe all things, hope all things, and endure all things, because godly self sacrificing love never fails. We need ministries and ministers who are motivated by love for Christ, not self. We need men who are humble in carrying out their duty and who are loving toward those they lead and serve. We need men who shock people by the depth of the sacrifice instead of by their choice of words or their unseemly behavior. We need shepherds who look like Christ! Can Our Experience Contradict Our Belief? Habakkuk knew that God could be trusted. He believed that God was watching over His people and would ultimately deliver them from sin and judgment. He hoped and prayed for revival and restoration as he had seen under the reign of Josiah, but as God warned him of the coming judgment at the hands of the Chaldeans (Babylon) this presented a perplexing problem for Habakkuk. We see the drama unfold in Habakkuk 1:12-2:1. This crisis of faith sprouted from his attempt to reconcile in his own mind two things that he believed were incompatible. Knowing all that he did about God and His holy character, Habakkuk simply could not understand how God could use the Chaldeans to accomplish anything good. God is good, holy, just, righteous, and perfect. He is so pure that He cannot even look on sin. Not that He doesn’t see it, but He does not look approvingly at it. God does not ever condone wickedness. However, God had just told Habakkuk that He was going to use the wicked, evil, perverse, murderous, proud Chaldeans as a tool for bringing judgment upon Judah for their sin. Habakkuk basically asked God, “How could You?” How could God even tolerate the Chaldeans, much less use them to judge Judah. He knew it was true that Judah had sinned and that God had promised judgment. But how could God use a much more wicked nation to bring about this judgment. If God had used the same standards for judging Babylon as He was using to judge Judah then Babylon should have already been wiped off the face of the earth. In comparison, Judah was righteous! Often times, problems arise that appear as if they will derail our faith. We find what we think are contradictions in the Bible, or our faith does not match our experience. Something happens and it causes us to doubt what we believe, either generally in terms of our overall view of life, God, the church, etc. Or specifically as it relates to certain doctrines which we thought we knew and understood. What are we to do when our experience does not match our belief? Should we change what we believe? Abandon doctrine, or faith, or church altogether? Or should we doubt our experience? Can we truly take an experience at face value if it challenges everything we have been taught and believe? The answer is that we should stop and wait! In the midst of this dilemma, Habakkuk did five things to resolve his seeming contradiction between the nature of God and His use of the wicked Chaldeans. He determined to face his problem and to maintain a right view of God. We need to see what he did so that we can learn to face problems in a manner that glorifies God, even when we do not understand what God is doing or why He is doing it. We can think of it this way: Habakkuk gives us five things we must do when faced with problems in order to keep our faith (and sanity) on track. In fact, we will use the word TRACK to help us remember Habakkuk’s solution to his problem. So then, my beloved brethren, let every man be swift to hear, slow to speak, slow to wrath. The second thing Habakkuk did was to restate the basic principles that he knew to be true. He went back in his mind before the problem had arisen and he recalled to his mind the truth that he was sure of before this came up. No matter what God was telling him and no matter how difficult it seemed that what God was saying was right, he knew for a fact that God was holy, pure, sovereign, faithful, and good. He asks a question and makes several statements about who God is to remind himself of these basic principles about God’s character. The third thing Habakkuk did was to apply the principles to the problem. If God was from everlasting, with an eternal perspective, then this judgment was not the final chapter in His dealings with Judah. If God was pure and holy, then this coming judgment is not in itself evil, but will accomplish some good. If God really was sovereign, then this chapter of history, dark as it may seem, was not happening by accident or chance. And if God was unchanging (“O Rock”) then He would not abandon His people but would still fulfill His promises to Abraham, Isaac, Jacob, and David. He went back to basics and applied them to what He knew to be true, hoping that his faith would mature in the process so that he could see what God was doing and why He was doing it. The fourth thing that Habakkuk did was to commit it to God by faith. This invasion of Judah by the Chaldeans was a tool in God’s hand for correcting and purifying His people. God meant to do good to them by using a wicked people to accomplish His purposes. How could He do this? Habakkuk did not know. So he went to his watchtower (Hab 2:1). The watchtower represents two things we must do in order to truly commit a problem to the Lord. First, he went away to wait for an answer, expecting God to answer him. And he also detached himself from the problem. He was up in a tall tower with a rampart, high above the city wall. From there he had a clear view, was all alone, had time to think, and sought for answers from the Lord. It may be the problem of what we are to do with our lives; or it may be some situation that is confronting us which involves a difficult decision. Having failed to reach a solution, despite seeking the guidance of the Holy Spirit, there is nothing more to do but to take it to God in prayer. But what so frequently happens is this. We go on our knees and tell God about the thing that is worrying us; we tell Him that we cannot solve the difficulty ourselves, that we cannot understand; and we ask Him to deal with it to show us His way. Then the moment we get up from our knees we begin to worry about the problem again. We also tell other people about it. If we are doing this, we have not left the problem with God. If you have a problem like this, leave it with God. You do not have the right to talk about it or brood over it any longer. In getting away from the problem, either by physical proximity, or mentally and emotionally, we need to learn the truth that just because we have a problem that does not mean that anything is wrong! God is still in control, and at times we simply must trust that He knows best. The last thing Habakkuk did was to keep His commandments. He would obediently wait for God to answer, and in humility he even admits that when God answers He will likely have to be corrected. He was ready to give an appropriate answer when God corrected him. If something was wrong, if there was a contradiction between Habakkuk’s belief about the character of God and his experience of what God said He was going to do, then obviously the fault was not with God. Habakkuk needed to be corrected and he was ready to be obedient, humble, and teachable. In fact, we know from Scripture that we cannot say that we love God if we are not willing to obey Him. So Habakkuk expresses an obedient attitude and in so doing proves his love for God as he waits for an answer to his problem. Whatever problem we face, we must be sure to do what we know to do while we are waiting for the answer. We must be obedient to the Word of God, and to our conscience. And if we come to understand truth, and are corrected by the Spirit through the Word of God and we have to change our minds about something, we must be ready and willing to cast off false doctrine and wrong beliefs for the sake of the truth out of love and obedience to our Lord. These thoughts are highlights from the sermon “Perplexing Problems”. Listen online or download it for later – always FREE. Remember that we are at war. We cannot afford to forget the fight, or to become lazy, apathetic, or complacent. All around us spiritual battles are raging as the enemy seeks to disable us in our pursuit of pleasing God and to derail our work to proclaim the good news that Christ has come to set the prisoners free. This war has eternal ramifications. We are fighting to honor our King, to defend His truth, to advance His Kingdom, and to rescue captives. If we falter and fail we dishonor the One who bought us with His blood! As we continue to look at each individual piece of armor that has been given to us by God in Christ, we now move to the second piece, the breastplate of righteousness. 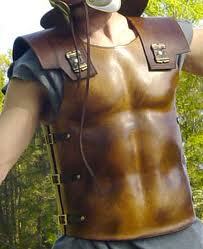 Remember from last week that the belt was foundational for the Roman soldier’s armor. The breastplate, and helmet were fastened to the belt, and the sheath for the sword was also attached within easy reach. Just as we learned about the belt of truth, so now we see that the breastplate is crucial for defense. For the Roman soldier the breastplate was made of think layers of leather and fabric, or for higher ranking men, it was made of molded metal. It offered protection against swords, spears, and arrows. It protected the body from the neck to the waist, covering the chest and stomach as it protected vital organs like the heart, lungs, liver, and intestines. If anything got through the armor a wound to this section of the body could be devastatingly fatal at worst, or it could cause severe and disabling injury, removing the soldier from action. For the believer, the breastplate is a breastplate of righteousness. Righteousness is a term that expresses rightness. In relation to God, to be righteous is to be holy. It is to be in a right state in our relationship with Him. So we see that to hunger and thirst after righteousness is to desire to be right with God. Specifically to Scripture, there are three kinds of righteousness. There is imputed righteousness, imparted righteousness, and un-righteousness. To compare the first two, we see that imputed righteousness is a right standing with God that is given to us, it is imputed. It is not our own righteousness. It is not righteous acts that we do. It is the righteousness of Christ that is given to us freely by grace as we are saved. Christ lived a perfect and sinless life in obedience to the will and Word of God. When He died on the cross as our substitute taking our sin and its penalty upon Himself, there was a great exchange. He took from us that which kept us from a holy God, and He gave to us that which gives us access to a holy God. He took our sin and gave us His righteousness, His own obedience and right standing with God. When that righteousness was imputed to us and we were counted righteous, when we were justified by faith in Christ, God looked at us and saw Christ’s perfection. Imparted righteousness is righteousness that results from our obedience to the Word of God. God has made us a new creation. He says in His Word that we are a new man created in righteousness and holiness. He even tells us that He has prepared good works for us by grace so that we might walk in them. From the Word of God we are sanctified, that is made more and more like Christ. And as we grow in this grace we learn to do what is right for the right reasons. These works, imparted to us and accomplished through us by the Spirit are pleasing to God. Think of it this way – imputed righteousness refers to our position in Our Lord and imparted righteousness refers to our practice in our life. One speaks of who and what we are in Jesus. The other speaks of how we live as a result of who we are. We see then that imputed righteousness is necessary for imparted righteousness. Our right standing with God motivates us and gives us the ability and power to do what is right. This is practical righteousness – practicing, that is doing over and over again, what is right in God’s sight. In order to do these good works we have to be obedient to principles of righteousness. We have to know the difference between good and evil, between that which pleases God and that which displeases Him. Imputed righteousness opens the door for imparted righteousness, which in turn motivates us to apply principles of practical righteousness and results in our being obedient and therefore holy. Do we remember on a daily basis that God commands us to be holy? (1 Peter 1:15-16). Holiness is easy, right? I mean, if we study the Scriptures we learn that God has given us everything that we need for life and godliness (2 Peter 1:2-4). So why is holiness so hard? Holiness is difficult because when we look at what God’s Word says, it tells us just how many people without God are holy. Who is righteous without Christ? There is none righteous, no, not one; There is none who understands; There is none who seeks after God. They have all turned aside; They have together become unprofitable; There is none who does good, no, not one. – Romans 3:10-12 (quoting Psalm 14:2-3). We see then that Christ alone is righteous. All that we have to offer outside of Christ is disgustingly evil and wicked (Isaiah 64:6). We might think that we can accomplish good things without God, and we may attribute good things to men and women who do not know Christ. But the truth is that without Christ we have nothing righteous to offer or to do. Even the good that we attempt for all the “right reasons” are but iniquity, sins of the self will, tainted by sin, and unholy. We have looked at imputed righteousness and imparted righteousness, but what about the third type, that which is unrighteous? Unrighteousness is wickedness, evil, and sin. We all know this unrighteousness when we see it, or at least we should. But sometimes unrighteousness disguises itself. At times it presents itself as self-righteousness, that form of righteousness that we have on our own without Christ. It may look good on the outside. It may look like we are doing what is right, being obedient to God. But when our heart is wrong, our attitude is selfish, and our motivation is driven by lust for the praise of men, then we see that the righteousness we have on our own is actually the complete lack of righteousness. It is the opposite of what it right. When it comes to righteousness there are three kinds of people: Pharisees, Phonies, and Peculiar People. The Pharisees were self righteous. They had no fear of men or God. All that mattered was that they were good and right and respected and looked up to and envied by others. It is a self serving code of works built upon the notion that we can work our way to heaven, pleasing God by all that we do and sacrifice for Him. The Phonies are those who have a false righteousness. It is powerless morality based on the fear of men or on a desire to please God on our own terms. These are phony because they have an outward form of godliness but deny the very power that imputes and imparts righteousness to us. The Peculiar People are those who fear God and have had Christ’s righteousness given to them. The have imputed righteousness and so are right with God and they see imparted righteousness working its way out in their daily lives as they seek to please and glorify God in all they do. They are peculiar because they are holy. They are separate from the world, they are different, they are full of power and joy and all the fruit of the spirit. Do we desire to be right with God? Do we know the difference between the different kinds of righteousness? Are we trusting in Christ to save us as He gives us His righteousness, or are we foolish enough to think that we can be good enough on our own to please a holy God? We have the breastplate of righteousness. Do we use it? CarBlogging Episode 2: What’s PREACHING ? What’s EXPOSITORY preaching ? Episode 2: What’s PREACHING ? What’s Expository Preaching ? Expository preaching vs Topical Preaching…..a few thoughts.